After Lukaas' passing, we were all very sad and it was hard to come in every morning and not have Lukaas there to greet us. 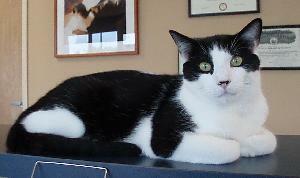 Dr. Tice went over to Safe Haven and Boone was one of the kitties she met that day. It didn't take long to realize that he would be a perfect fit. Boone is very sweet and LOVES attention. He follows us around all morning, chatting away, and he loves to be picked up. He has become very comfortable in the front lobby and is enjoying all of the visitors who come in to meet him. We are very happy to welcome Boone to the Cat Care family! Lukaas moved in before we even opened! 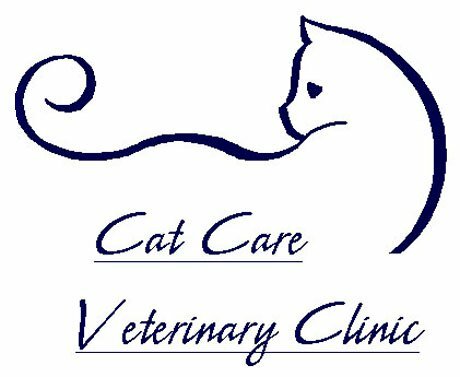 Dr. Tice knew she couldn't have a clinic without a clinic cat so we all went to Safe Haven where he picked us. This has been "his" clinic ever since. Dr.T thinks she's the boss here but Lukaas begs to disagree! He is a very busy boy supervising every aspect of Cat Care Vet Clinic. 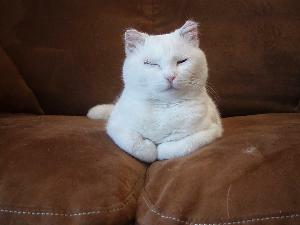 His primary goal is be sure that all of his fellow royal felines, as well as their humans, receive the best care ever. Sadly, we lost our beloved Lukaas on February 17, 2019. He had been fine until one Saturday when he was not wanting to eat and was hiding (anyone who knows Lukaas, knows he never did this). 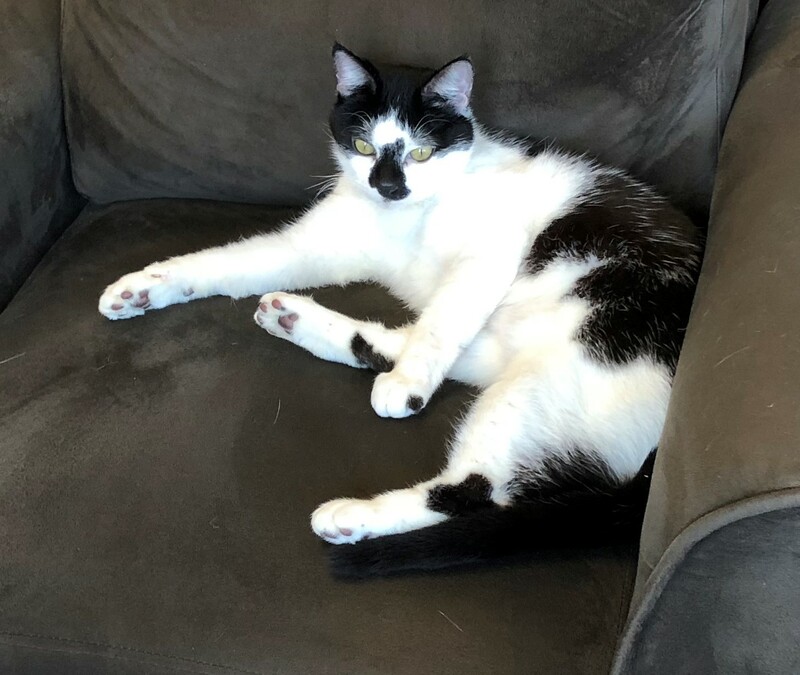 Abdominal ultrasound was performed and nothing obvious was discovered, but we did start him on some medications for a possible kidney infection, as well as doing subcutaneous fluids and appetite stimulant. He did much better for a week or so before he started declining again, this time much more dramatic. We made the tough decision to let him go. We miss him daily and the clinic just isn't the same without his presence. He is sorely missed! Gus came to us as a stray that was living out of the Bojangles dumpster on Miami Blvd. He had most likely been hit by a car sometime in his past because he had a bum left front leg...it worked pretty well and was not painful but he couldn't straighten it...thus he had a pretty noticable limp. Gus was a sweet natured, low profile cat, but if you sat on our lobby furniture for any length of time, Gus most likely made his way into your lap. Gus was perfectly fine on Friday 9/29, but that Saturday we noticed his breathing was a bit off. X-rays showed a large mass and severe fluid build up in his chest, that was most likely cancer. Due to the severity of his condition, we made the tough decision to let him go at that time. We will miss our sweet, lovable Gus-Gus! Oscar came to us in October of 2009. He had been living in a house with 68 other cats and conditions were not the best. A rescue group got involved and asked if we could take just 1 cat. So....we said "yes" and had every intention of finding him a home...and NOT with us. 3 days and we knew he was not going anywhere...what the character he turned out to be! He spent his time between the clinic, during office hours, and Dr. Tice's house in the evenings. He had a purr that you could hear from across the room. Oscar had been dealing with a vestibular disease since last December. He had been doing really well, but it was slowly progressing and we suspect it was a cancer that had spread to his lungs. He took a rapid decline over a few days and we decided it was best to let him go on Wednesday 10/04/17. He was quite the character and will be missed dearly! Chai became a member of our family in September 2006. She was rescued by some well meaning people and our hearts just melted when we saw her. She was in pretty bad shape and we all think that if she had been on her own only a few days longer that she most likely would not have made it. Instead she stole our hearts and became our little Clinic Princess. Unfortunately her health issues progressed to a point that we all decided that she would be much happier in Kitty Heaven and we had to let her go (7/21/11). We are sure she is now a Princess in heaven and is still shredding feather toys as she keeps an eye on Lukaas. We know that she is happy, and that it was for the best, but we miss her very much.